Walking to school in Ngara can be pleasure or torture. I live in Afriline, an old UN compound from the time of the Rwanda genocide in 1994 which still bears the letters UNHCR (United Nations High Commission for Refugees) on the front gate. The compound was not built for the poor refugees, but for the foreign administrative staff. As such, our house is solidly built of concrete with a large porch along the front and a metal roof. The vegetation in the compound appears to be mostly imported, wtih lots of grass, flowers, and eucalyptus, hibiscus and fruit trees. The compound faces a cliff on one side, looking out over a valley. Otherwise it is surrounded by banana fields and a village. The infrastructure has not fared as well as the vegetation. We have large floodlights throughout the compound that are turned on at night. Unfortunately the power is often out, and we have the darkest night I have ever seen, even when the stars are shining. I usually get up at 5:30 a.m. and enjoy a little morning coffee while trying to get on the internet, which is often not successful. If the power is out, I reset my alarm for 6 a.m. At that time I get up with my flashlight and try to dress, brush my teeth, and eat a couple of wheat biscuits or a hunk of bread to fortify myself for the day. When we got here in July it was still pitch black at 6:30, but now we have daylight so I can walk to school. Before I took a motorcycle to school and could leave a little later. It takes me a little over an hour to walk the 6 km to school. It takes a little longer coming home because it is uphill. The first 20 minutes is on a dirt road through houses and banana fields. Where the dirt road meets the main, paved road to town there are a few small shops and open air produce stands. Traffic is light, with a few cars, bicycles, and motorcycles. They follow the British system here and drive on the left. I haven't seen any sidewalks anywhere around here and walk on the side of the road, which is full of dirt, pebbles, and sometimes mud. My feet never feel clean, even when I wear socks. Some of my students pass me since they walk faster, smile and say, "Good morning, Madam!" Other people of all types greet me. Small children yell, "Mzungu!" (white person) to get my attention then say, "Good Morning" or Good afternoon," and often get the time of day wrong. Goats and chickens graze on the side of the road, and occasionally someone herds a group of goats or cows along. The banana fields continue behind the houses that front the road, and you see old, young, and in between people carrying huge machetes, which can be a little disconcerting. As I near Ngara proper, I pass a gas station, mosque, the bank, the post office, several churches, and an internet cafe. After about 40 minutes of walking I am "downtown," which consists of several dirt streets of small shops and a couple of large, old, open sided UN tents which house the market stalls. There is also a transportation area where taxis, motorcycles and buses can be found. Most of the buses leave between 6 and 7 a.m, except the through bus to Dar es Salaam on the coast, which leaves at 1 p.m. It is 8-10 hours by bus to Mwanza, the nearest city in Tanzania, and about 26 hours by bus to Dar. I pass town and Paradise, the only Western type restaurant building in town, although it only serves African food, buffet style. I take a shortcut through more banana fields and come to Ngara Secondary School, which is just past the city limits. At the entrance, students are often getting "punished," which can mean doing chores or getting hit. Other students are often bringing water to the school on buckets on their heads from the water source across the main road as part of their daily tasks. I am supposed to be at school by 7:30 to sign in the log book and start classes at 7:45. I am fortunate not to have had much rain in the mornings, but the afternoon rains can be brutal. Most people take cover and laugh at the crazy Mzungu getting soaked despite using an umbrella. The top of me stays fairly dry, but it takes about 3 days for my shoes to dry. We have no heater, clothes dryer or hair dryer to speed the process. The rain can last 20 minutes or all night. All traffic seems to disappear when it rains, so there is little chance of getting a taxi or a ride. The "heavy rains" are supposedly in January and February, one reason I am not planning on staying around after this term. The periods last 40 minutes, but all of my classes are double periods of 80 minutes, which are better if you are trying to actually teach something. 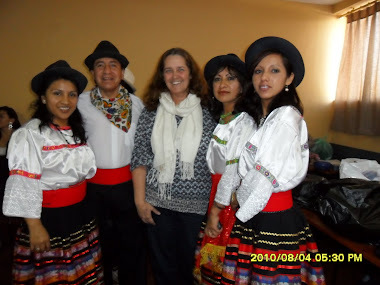 I had good training at my TEFL (teaching English as a foreign language) course in Argentina and am comfortable teaching. I have only taught adult foreigners in the USA, but I believe the students here are more polite and attentive than American students. They stand up when I enter the class and say "Good Morning, Madam." I try to start with a game or other activity to engage them before starting my subject for the day. We have no textbooks so I write a lot on the blackboard and am full of chalk dust by the end of the class. The chalk box says "dustless," but don't believe it. The students have exercise books for each subject that they take notes and do exercises in. Sometimes I catch students studying exercise books from other classes and I just close them and say "English." Each class has an assigned monitor who keeps track of attendance and erases the blackboard for me. I teach 2-4 double periods a day Monday through Friday. Mondays and Fridays are my short days when I finish at 11 a.m. The teachers get free chai (hot tea) in the staff room at that time and we can buy mendazis (like fried donut pastry) for about 10 cents apiece. Students serve the tea and also do other chores, such as cleaning up the offices, classrooms, and school grounds. There is no such thing as a school janitor, but there is a night guard. When I finish my classes, I walk home, often stopping on the way to pick up food or other things I need. Lately vendors have been putting their little charcoal stoves along the road and selling grilled corn. I usually like it but they put it directly on the grill it instead of leaving the husk on so it is very dry and not so good. I have had a couple of outfits made by a seamstress in town so I visited her several times. Almost everything here is fresh and without preservatives so food, including bread, needs to be purchased often. The eggs here are small and have light yellow yolks and runny whites, which seems odd to me, but Breana figures that is probably the way they are supposed to be without chemical engineering. A man at the end of my road sells hot chapattis for about 12 cents apiece, and I often get a couple of those for my lunch. We do eat a high carbohydrate diet here. Many days, especially if the power is out and I can't cook or wash produce or dishes, that is all I have. On the other hand, we have access to wonderful fresh fruits and vegetables all the time. I don't feel comfortable eating them raw, though, unless I wash them in hot water first. I think the food and water in Ngara is pretty safe, but I am leery of the exception.